Mazars is an independent, integrated global partnership and leading audit, tax and advisory services firm. We specialise in providing high caliber services for listed and private companies, regulatory bodies, public interest organisations, owner-managed businesses, government organisations and high-net worth individuals. As one of the largest audit, tax and advisory firms in South Africa, Mazars has a long history of professional excellence. Our commitment to the care of our clients and their businesses is strongly reflected in the loyalty they show us, with many client relationships spanning more than 50 years. We pride ourselves on being big enough to service international listed clients, yet small enough to help small companies grow and prosper in their environments. Mazars has grown dramatically in size and strength over the past 10 years. Since 2006, Mazars South Africa has opened a further four offices nationally and the firm is now represented by 12 offices in the following cities – Bloemfontein, Cape Town, Johannesburg, Durban, East London, George, Kimberley, Kathu, Pretoria, Paarl, Plettenberg Bay and Port Elizabeth. 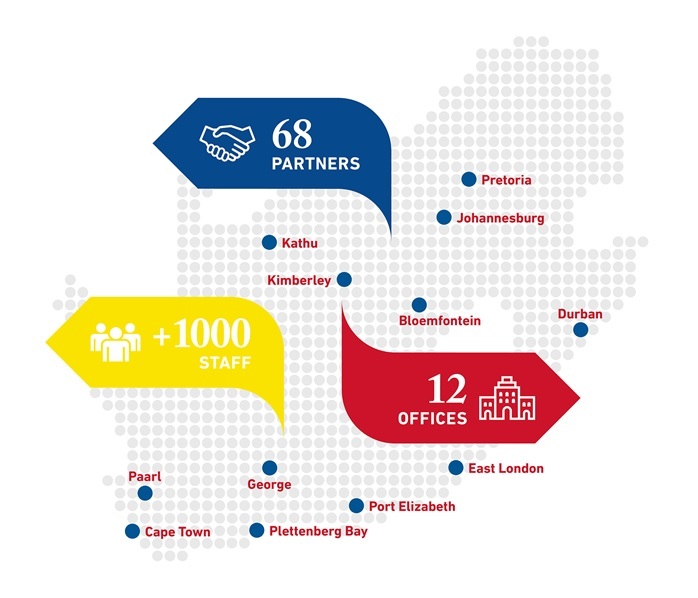 Nationally Mazars currently has 68 partners and employs over 1000 staff members. Internationally, the firm is represented by over 18 000 employees operating in 79 countries. Should you be interested in joining Mazars, please click here to apply. Download our Graduate Brochure from here.